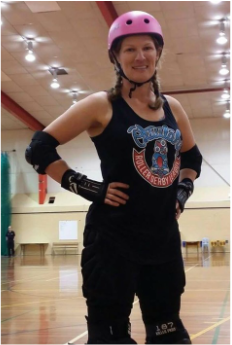 Miss N. Marbles - 02 - Christchurch Roller Derby. Strong City. Stronger Skaters. After 3 concussions (mostly non-derby) I figure I must be missing a few marbles by now. #02: the number of kids I have. Being awesome prior to my first coffee in the morning. The struggle is real! Such a laid back and fun family. I felt accepted and encouraged immediately. All of those players you see whizzing around looking all professional were once beginners, falling on their butts too. Just keep getting up. T-Rex cos he's all stomp, stomp, look at me with my tiny wee arms. 'On the table, with my hands in the air'. I'm a professional at it.